Today I will continue the theme of “start to finish” with a botanical painting completed this week. 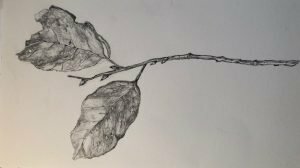 I have been studying the genre of botanical drawing. 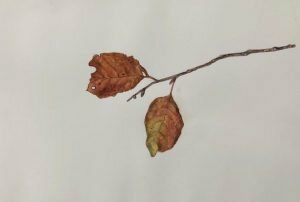 I am not saying I have arrived as a botanical painter but I decided today to share the process. Besides being amazed that I completed this painting I also was reminded that botanical drawing fits my preference for solitude. Botanical drawing requires close and quiet observation. Starting the process begins with finding an object from nature that is intriguing and would hold my interest. 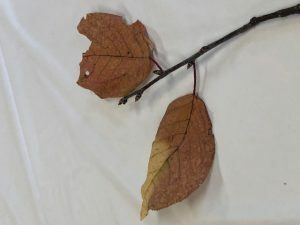 On a walk one day I looked down at the trail and found this twig with two leaves barely hanging on to the twig. The leaves were stubborn. They did not seem ready to leave the anchor of the twig. The edges, scars, and veins of the leaves added to the story. I was curious if I could turn this object found in nature into a painting. The twig with two leaves sat on my work desk for many weeks. Once in awhile I would study it and during this time the color and shape of the leaves changed and shifted. It was time to pick up my pencil and study the shape and values with a drawing. An image which one can return to and enjoy looking at more than once. An illustration which shows the plant as interesting and attractive. Skill in the use of whatever medium and technique is used to create the image. Once my drawing was completed I worked out the color palette that would describe the various parts of the late autumn leaves. At this point I also photographed the leaves and twig from different angles and different points of interest. Eventually, I would be working from the actual object, drawings, and photographs. The painting process can be tedious. Layers of color are applied as a thin glaze. The layers continue to replicate the range of color values observed. The first few layers become a road map. As layers of glaze build upon one another the surface subtleties of color, value and texture are expressed. The painting goes through many many layers of glaze. Not only is color put down onto the surface of the paper but it is also lifted off. The process is one of adding and subtracting color. At some point the painting announces that it is finished. Hanging On. 10″ x 14″ Watercolor. Kathy Grundei. 2019. Mary Oliver put into elegant words why I am drawn to this genre of painting. 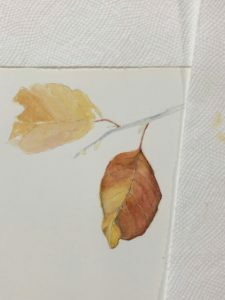 She wrote, “Let me keep my mind on what matters which is my work which is mostly standing still and being astonished by what matters.” I have always had a deep appreciation for what botanical artists have recorded as they stood still.